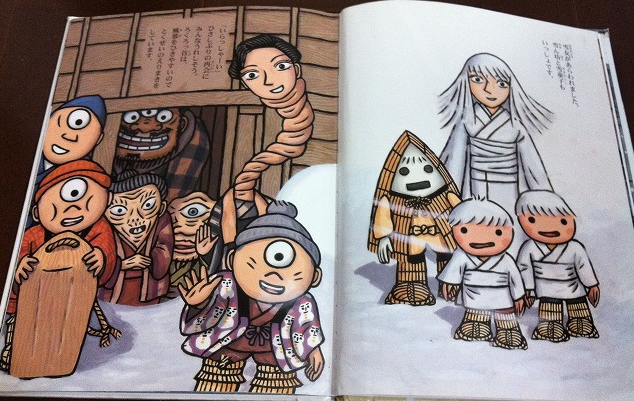 Hopping on one foot and eternally hunting for children to eat, the Yukinba is one of Japan’s most horrible snow monsters. 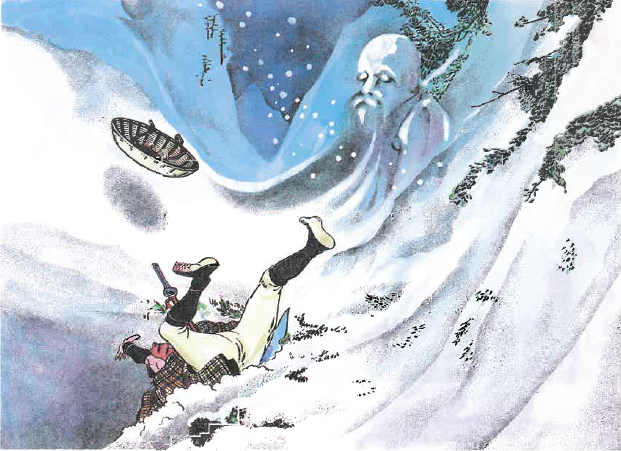 While most snow monsters, like the Tsurara Onna and the Oshiroi Baba, bring some measure of cold comfort, the Yukinba is all bad. Yukifuriba may have a prettier name, but she is equally dangerous. 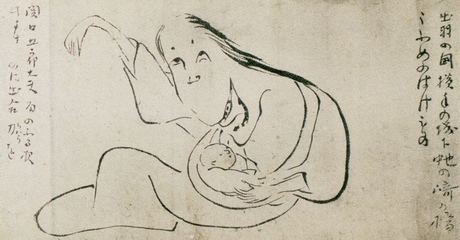 The related yokai, the Yukifuriba, has a much more poetic name. 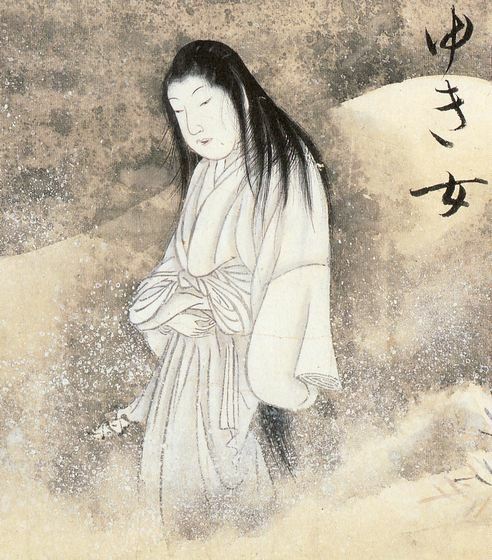 雪降り(yukifuri; falling snow) + 婆 (ba; hag, old woman) makes for The Old Woman of the Falling Snow. Names aside, the main difference is of appearance. 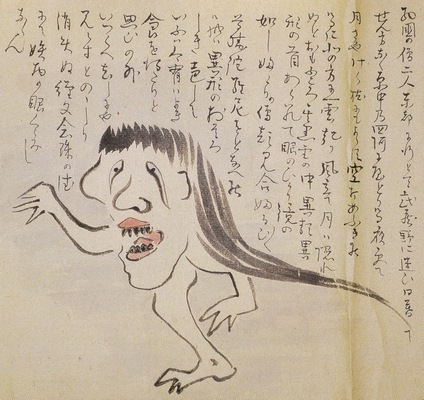 The Yukinba looks like a nightmare; a giant, old woman’s head hopping on one leg, with sharp, biting teeth and grasping hands. 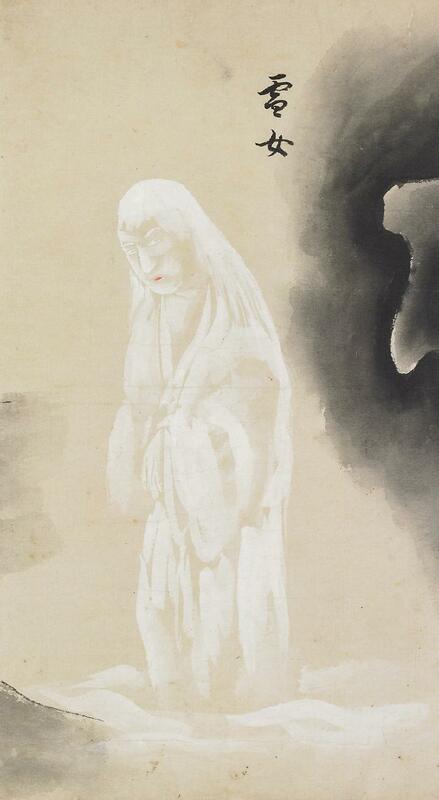 The Yukifuriba looks like a regular old woman with pale, white skin and wrapped in a thin, white kimono. 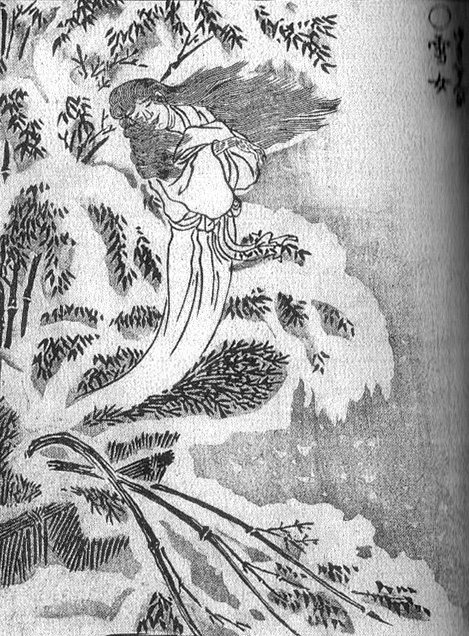 In fact, the Yukifuriba looks like an elderly version of the young and beautiful Yuki Onna. The Yukifuriba’s most distinguishing characteristic is the red rope she carries. 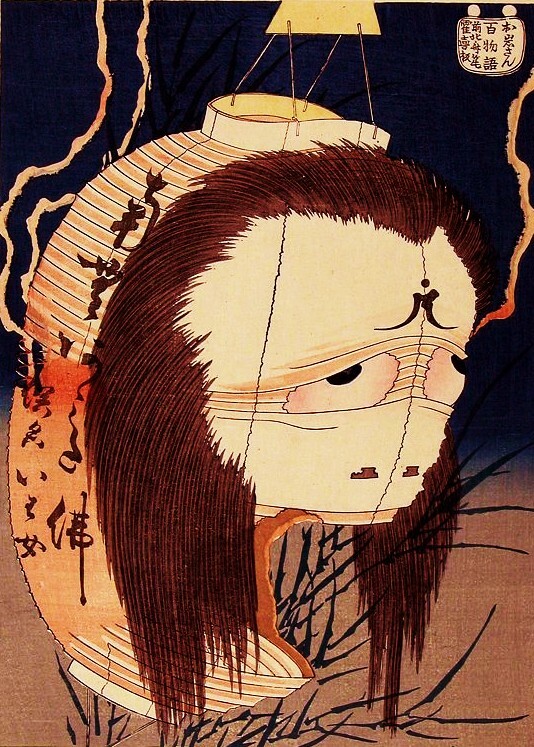 Yukinba is a relatively obscure yokai, coming from town of Hirano in Ehime prefecture. 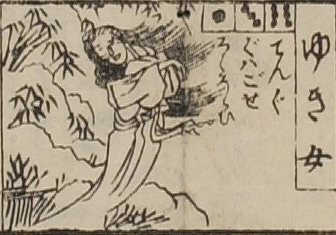 She appears only in a single scroll, the Meiji period Bakemono Emaki by an unknown artist. 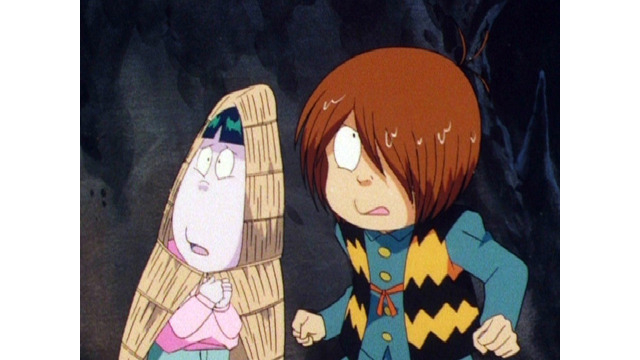 Both the Yukinba and the Yukifuriba are notorious child eaters. 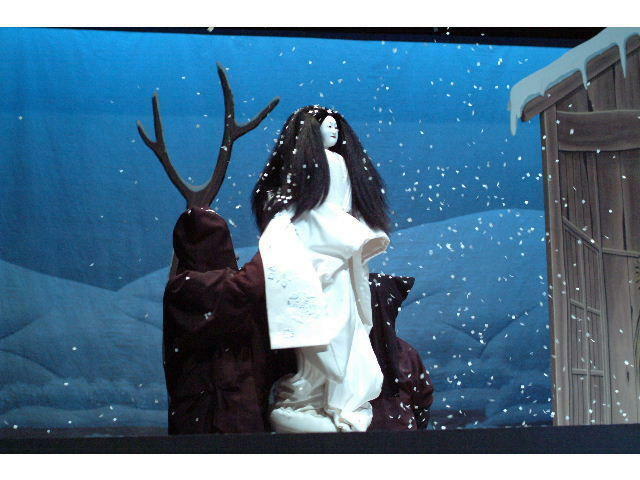 They hide in the mountains and call out to children in an old woman’s voice, preying on the trusting nature of children. They lure they children in close them capture and eat them. 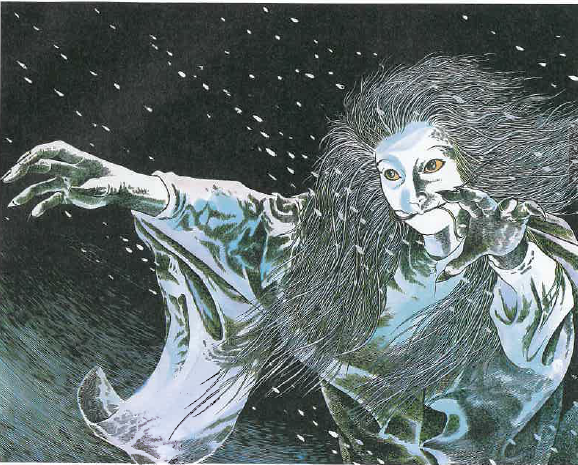 Parents in the frozen countries, and especially Echigo province (modern day Nigata prefecture), are warned not to let their children outside to play on nights when the Yukinba and Yukifuriba are hunting. Child eating is a trait they share in common with the Yamauba mountain witch. 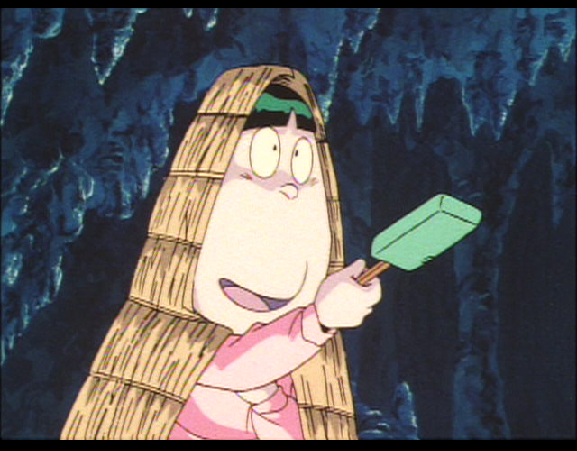 In fact, the Yukifuriba is considered to be a “snow version” of the Yamauba in the same way that the yeti can be considered a snow version of sasquatch. The Yukinba belongs to a wide class of one-footed yokai grouped under the general name of Ippon Datara. Most of these are snow monsters, like the Yuki Nyudo and the Yukibo. The legend comes from an uneven patter of snow melting. When snow melts in pockets, it looks like something with a single, large leg has been hopping around the forest. In the case of the Yukibo, this happens in tree wells. Ancient Japanese people saw these markings, and imagined a one-legged snow monster to account for them. The exact reason behind the red rope of the Yukifuriba is lost to time. But there are two compelling reasons. The first, and most simple, is that she uses it to tie children up and eat them. The second, and most compelling, is that in ancient Japanese funerals corpses were bound up before being buried. This job was usually done by an outcast of some sort, as handling corpses was considered taboo and unclean. Old women with no other means of support sometimes took on these kind of jobs to survive. So the image of the Yukifuriba carrying her red rope might be an image of a poor old woman coming to bind up a corpse—certainly a frightening thing to think about. Another snow monster for December! These ones are actual monsters, although rather obscure ones. Accounts of the Yukinba are rare, and there is only this single historical picture that I was able to find. I couldn’t find any pictures of the Yukifuriba. They didn’t even rate an entry in Mizuki Shigeru’s Mujyara, at least not in volumes I have. 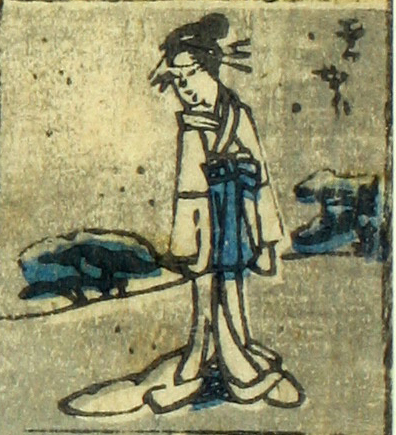 It is possible they appears in later volumes.